ZenPad series launched by Asus gained much applauds from gadget lovers. Keeping that in mind Asus updated this ZenPad series with two more tablets. One features 8 inches and is named as Asus ZenPad 8 (Z380M). 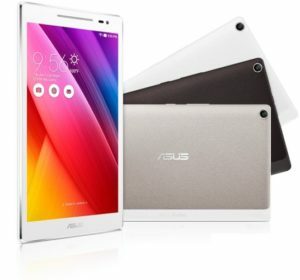 The other one is with 10 inched screen and is named as Asus ZenPad 10 (Z300M). These new devices fall in the line of basic or mid-range devices. Asus ZenPad 10 measures to be 9.9*6.8*0.3 inches and has a weight of 1.1 pounds. ZenPad 8 is lighter with a measurement of 8.2*4.8*0.3 inches with a weight of 12.3 ounces. The thickness of both devices comes to be the same. ZenPad 10 is having a screen size of 10 inches edge to edge while ZenPad 8 is having a screen size of 8 inches. Both the tablets are identical when it comes to resolution. Both devices feature 1280*800 pixels resolution. Earlier devices of ZenPad series were supported by Intel processors. But when it comes to the case of ZenPad 8 and 10, they are backed by MediaTek MT8163 Quad Core processors. But when speaking about memory, ZenPad 10 features a RAM of 2GB, while ZenPad 8 features a RAM of 1GB which can be enhanced upto 2GB if required. This difference is also there in case of storage also. ZenPad 10 provides you a storage capacity of either 16GB or 32GB. While ZenPad 8 grants an internal storage of either 8GB or 16GB. This storage can be expanded with the help of microSD memory cards. Both the devices run on Android v6.0 Marshmallow. When speaking of camera specifics, both devices have the same features. The main snapper is loaded with a lens of 5MP. ZenPad 8 and 10 also have front cam powered by a lens of 2MP. This will help you to have selfies as well as video calls with your loved ones. Both ZenPad 8 and 10 supports WiFi connectivity with 802.11a/b/g/n. These gadgets also support Bluetooth with v4.0. They also provides for GPS connectivity. Both these gadgets feature micro USB ports for faster data transfers. They also have headphone jacks allowing you to pin headsets. Asus zenpad series 10 is powered by a battery with a capacity of 18Wh, while ZenPad 8 is powered by a battery of 15.2 Wh. These batteries are energy efficient and help you to make the devices function till dawn. Asus always tried to provide most of their gadgets at reasonable prices. The two new launches from Asus also fall in this category. ZenPad 10 is tagged with a price of $223 while the ZenPad 8 costs you $178. If you prefer a better gadget from Asus, then you can also opt for Asus ZenPad S 8.0. This device is having a screen resolution of 2048*1536 pixels giving an HD feel. This device functions on a better processor of Atom Z3580 with an enhanced RAM of 4GB and with an extended storage of 64GB. Asus hasn’t officially declared this gadget.